A procedure shall be established to govern the management of appeals and complaints. Such procedure shall ensure that an appeal / complaint is investigated, documented, corrective actions implemented and outcomes communicated to stakeholder/s. An appeal is understood to be initiated by a client in the event of them querying the rating issued by BEE RATED. A complaint is understood to be initiated by a third party in response to actions / omissions taken by BEE RATED / its employees / members. The party conducting the investigation into the appeal / complaint shall be independent from the activities for which the appeal / complaint was lodged. In order to ensure for this while BEE RATED is a two member organisation, provision has been made in the structure (Sec7) for an independent, outside, chairperson for appeals and complaints. Appeals and complaints shall be handled confidentially and with sensitivity. Measured entities may appeal, in writing, to the chairperson of the verification committee within 5 working days of receiving their BBBEE rating. The appeal shall be acknowledged, in writing, by the chairperson of the verification committee within 2 working days of receipt. The chairperson of the verification committee shall establish the Appeals Committee (made up of the two BEE RATED members and the independent chairperson) to conduct a review of the measured entities’ file and if necessary carry out an on site evaluation to establish the validity of the appeal. The independent chairperson of the Appeals Committee shall make use of the relevant document (Sec4F) to record the appeal, the process followed and remedial actions implemented. The appeal should be resolved within 15 working days of receipt. In the event of additional time being needed the measured entity will be informed thereof and the reasons therefore in writing. Findings will be discussed and agreed by the members and the outcome communicated to the measured entity by formal written communication. If the appeal finding upholds BEE RATED’S original rating the measured entity will become liable for costs incurred in the execution of the appeals process. In the event of the appeal finding is in favor of the client BEE RATED will become liable for all costs incurred in the execution of the appeals process and the rectification of the verification process. 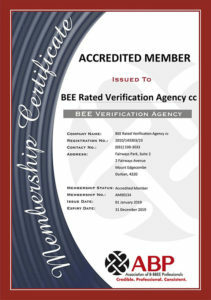 BEE RATED retains responsibility for all decisions at all levels of this process. The appeals process shall be handled in a non discriminatory manner and shall in no way prejudice the measured entity who has lodged the appeal. Third parties may lodge a complaint, in writing, with a member within 5 working days of the incident they are complaining about having occurred. The complaint shall be acknowledged, in writing, by the member within 2 working days of receipt. The member shall then establish the Complaints Committee (made up of the two BEE RATED members and the independent chairperson) which will then conduct an investigation in order to establish the basis of the complaint. The Independent Chairperson of the Complaints Committee shall make use of the relevant document (Sec4F) to record the complaint, the process followed and remedial actions implemented. The complaint should be resolved within 15 working days of receipt. In the event of additional time being needed the complainant will be informed thereof and the reasons therefore in writing. Findings will be discussed and agreed by the members and the outcome communicated to the complainant by formal written communication. The appeals process shall be handled in a non discriminatory manner and shall in no way prejudice the third party who has lodged the appeal. Appeals and complaints shall be recorded as per Sec4F.